In this article, you will learn how to create a conversational app with Monaca Cloud IDE and api.ai. 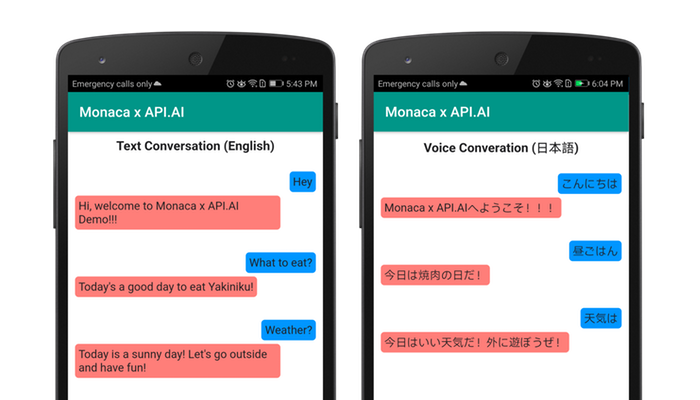 api.ai is a natural language interactions platform created by Google. We will demonstrate how to integrate Google’s api.ai with Monaca Cloud IDE using Angular 1 and Onsen UI v2. The integration is done based on apiai-cordova-client plugin. Thanks for posting this awesome tutorial. Rather than using Angular 1, i would like to use VueJs for this app. Can you please give me any tutorial link for that? @nasirkhan Unfortunately, we don’t have this kind of tutorial for VueJs yet. However, we will consider it. Thanks for your feedback. I am getting ReferrenceError APIAI Plugin is not defined. Any help on this please? I’ve modified the app and now the error is fixed. Please import the project again. I also made some changes to the plugin itself since there is a broken reference file in the plugin which will cause the build to fail. Therefore, you need to re-import the project and test it on custom Debugger or build app. Let me know if you still have the same issue. Good luck. When did you import the project? I just imported the project and test it without any issue. Would you please try to import the project again? Could you use cordova 6.5? @thanh How did you test the project? You need to run this project on Custom Debugger or build app. Standard (store) debugger is not working because the apiai-cordova-client plugin is not included. @khemry this error ‘‘ReferrenceError APIAI Plugin is not defined’’ upon the launch of the app within the Debugger is still prevailing for me too. Do you have any idea what it is referring to. @steverock Did you test it on standard Monaca Debugger? Please use custom Debugger to test this project. Hi @khemry thanks that worked for me. while i import and run the project… it says apiaiplugin not defined !! !